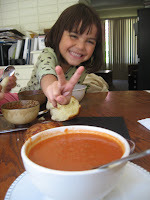 The Joli Times: Day Two aka Peace, Love and Tomato Soup! Day Two aka Peace, Love and Tomato Soup! So today the tab came to a whopping $5.35! Breakfast was nothing more than a few huge gourmet blueberry and apple muffins we ate on the run to a free movie viewing in the morning at the local indie film theatre. These we acquired for free last night as end of the day left overs from a sustainably minded restaurant. Ditto lunch! 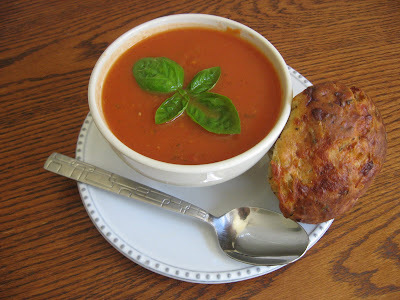 Lunch was a perfect bowl of tomato soup garnished with fresh basil from our garden and paired with a gourmet cheese muffin. All saved from what is sometimes thrown out. Many restaurants around the country that cook fresh daily have some amount of wasted food by days end. Ask for it before it is just thrown out..... unless you are prepared to dive for it ( I'll pass, thanks ). Sometimes they say yes and sometimes they say no. Having said that, there are still no free lunches though! Our girl was in desperate need of some yogurt. So we caved and spent the 50 cents on that for her! Totally worth the price of admission though just to see that banana flavored yogurt mustache stretched across the center of her face! Love that kid! 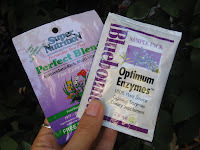 We snacked on some of yesterdays saved free samples from the ribbon cutting and popped a couple of free vitamin samples from a new health food store in town too. Dinner was simple again. With some herby eggs on leftover rice and some pesto pasta ( an absolute favorite of the ten year old!). A bit of frozen peanut butter cup for a dessert, some juice and everyone was stuffed. 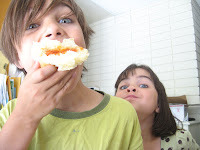 Although we are omnivores now (James and Aleli were vegetarian for about 6 or 7 years each), we tend to eat meat very sparingly anyway. So these mainly vegetarian meals are regularly featured guests at our table. It's absolutely wild how differently we are eating when cost is the primary concern! We would love to eat as healthily as possible during all of this as well. But if it weren't for the fact that we have simple tools at our disposal like a stove, a fridge, and a group budget, it is doubtful that we could eat for a dollar a day at all. How do the worlds homeless do it?!!!! We normally have a far wider range of options at any given meal, more fresh produce, and more organic offerings. Free samples and finds have really stretched what is possible..... even just in the first two days. As we start to forage in local gardens we hope the meals will be cured of their bad case of "the beige" ( grain on grain on, oh yeah, more grain ). Well, it's more than one simple little thought actually. It's an article by one of Aleli's favorite great minds right now, Frances Moore Lappe. 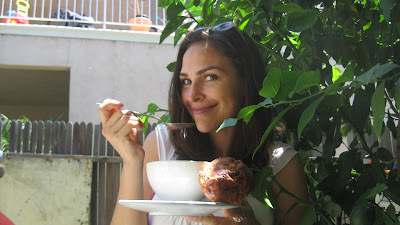 She is the author of several books, articles and movements, including the well known/loved Diet for a Small Planet. She continually dispels the myth of scarcity as the reason for the worlds hunger and "shortage" issues. There is in fact more than enough to go around! 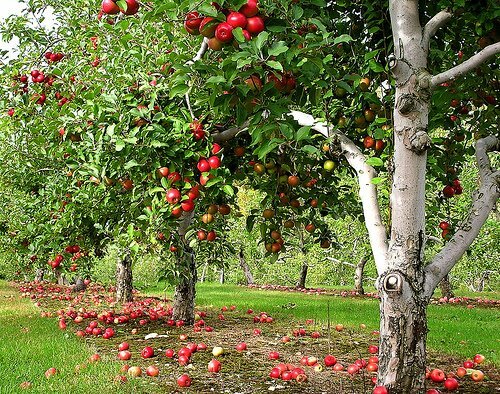 We've already begun to see that there is abundance everywhere...... especially in this country. Anyway, please read and enjoy the article on the link below from this amazing thinker, visionary and humanitarian. You'll be glad you did! 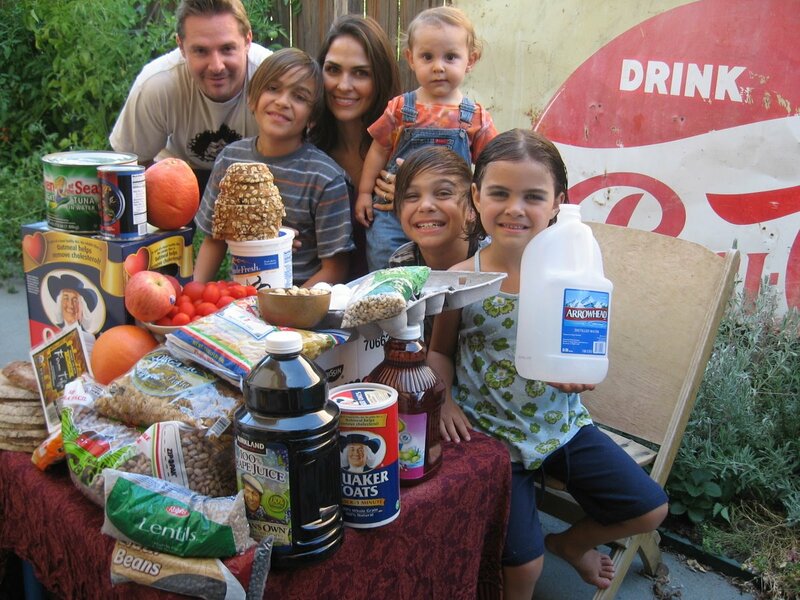 JAMES, ALELI, & FAMILY, LOVE THE MONTH OF AUGUST! IT'S A GREAT TIME OF YEAR!!! YOUR BLOG IS WONDERFUL!!! REALLY ENJOYED IT. Pick a good topic (one you’re most comfortable with), pick a memorable name (In the Greenroom anyone? ), Pick your blogging platform and choose a free one (like WordPress or blogspot) and start writing! So how do you make money? Get ads on your site via ad networks like Google ads and adsense). 36 million women a week now read blogs. LOOK FOR YOUR "FLOWERS" IN THE MAIL THIS COMING WEEK. SOMETHING FOR YOU AND THE "KIDDOS". HAVE A WONDERFUL DAY. LOVE, MOM "VOGT"
P.S. WOULD LOVE TO SEE A PICTURE OF THE TOMATO PLANTS. ALSO, HOW MANY TOMATO'S HAVE YOU GOTTEN FROM THE PLANTS SO FAR? There's a French saying : "Qui dort dîne", which means "He who goes to sleep doesn't need his dinner". I love your blog and articles. 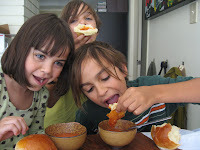 I am a teacher in France, and worked witrh my students on the pictures of Hungry Planet. I'll use your example to show that stereotypes cannot fit to the millions of inhabitants of a country ! Thanks a lot, and many good wishes to your beautiful family !